‘Panicky Pup’ is one of those very Silly Symphony-like Aesop’s Fables. It starts unremarkable enough, with several farm animals making music and dancing to it. At one point the cartoon starts to focus on a pup, but the short really gains momentum when the pup chases a cat into a well. Almost immediately, he’s struck by guilt and the complete surroundings turn into a nightmare haunting him. During this sequence the scenery changes frequently around him, as if the pup is transported through time and space, adding to the surreal atmosphere. 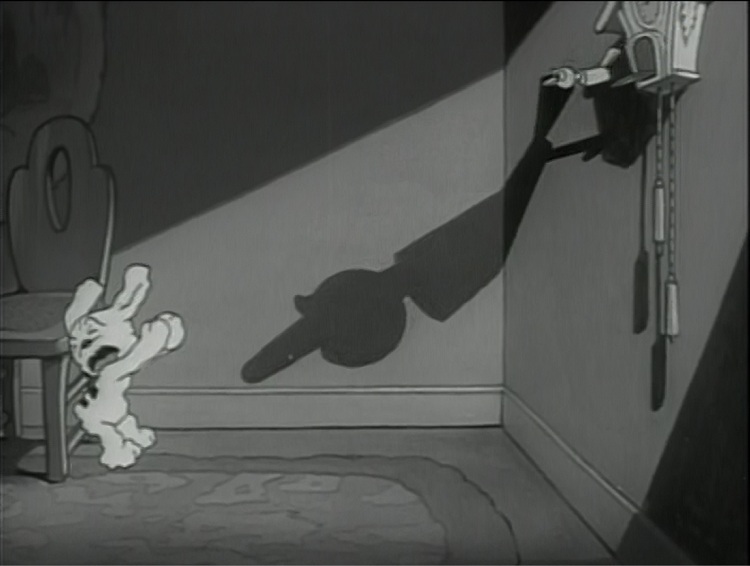 ‘Panicky Pup’ mixes Disney and Fleischer influences (comparable cartoons are Disney’s ‘The Cat’s Out‘ (1931) and Fleischer’s ‘Swing You Sinners!‘ (1930)), like no other studio did, with surprising, if uneven results. The cartoon is the direct ancestor of other guilt cartoons like ‘Pluto’s Judgement Day‘ (1936), ‘Pudgy Picks a Fight‘ (1937) and ‘Donald’s Crime’ (1945), showing that Van Beuren had a much more interesting and forward-looking outlook than most reviewers grant the ill-fated studio.